Got stuff you don’t want but don’t want to see it wind up in a landfill? I’m with you. I’ve always been reluctant to send any item to the trash heap that might have a more appropriate destination. Surely someone can use this bag of marbles/lamp that needs rewiring/collection of old knitting needles, I would think to myself as my hand hovered over the trash can with the item in question, but who? For years, I kept a running list of places that accepted odd items. The library had a receptacle for old batteries? Got it. My dry cleaner took back wire hangers? Noted. Animals shelters accepted used blankets for their dogs and cats? Good to know. My list turned into a website, and StuffYouDon’tWant.com was born. While StuffYouDon’tWant.com provides suggestions for how to get rid of your unwanted items, it’s never going to give you the perfect solution for every solid waste situation. Here are some additional tips to make the most of the site, and help you with your own process of decluttering with an environmental bent. If you drove fifteen miles away to drop off three DVD cases, emitting greenhouse gases the entire way, your journey has been an environmental failure. Your goal should be to dispense your extra goods in the normal course of your day, if possible, without using any additional resources, especially if them items in question are of comparatively little value. If you have four-dozen boxes of cookies left over from an event, by all means bring them to the nearest food shelter. If you have eight cookies left over from last night’s batch, put them out in the break room at work and be done with it. Similarly, if you have a single item that you’re not sure what to do with but still has life in it– a kid’s winter coat, a beat-up desk, a slightly used kite – either ask around or join your local Buy Nothing group, which gives you a chance to post unwanted items to offer to your immediate neighbors. Rerouting potentially useful items out of the landfill is a good idea for efficiency and for the environment; not putting hazardous materials into the trash is a legal obligation. Educate yourself about common household items that need special handling, like batteries, paint, aerosol cans, toner cartridges and electronic waste. If you’re going to a place like Staples, anyway, they usually take back printer cartridges; likewise for batteries at many hardware stores. In most cases, it’s better to store up the hazardous stuff you don’t want and keep an eye out for a hazardous waste collection event near you. Check your town or city’s local listings. If you’re moving and have rooms full of furniture, clothes, books, and other ordinary household goods, the most efficient thing to do is to bring the whole lot of it to your local thrift store or Goodwill. However, if you have a considerable number of a specific item, that’s when targeting comes in. A dozen prom dresses? There are several nationwide organizations that collect them for high school students. Have you done a huge construction project and have a lot of leftover materials and tools? Habitat for Humanity is a good place to start, but there are many other options as well. When I have only a few of a single category of items, say, a half dozen cans of soup, I collect related items from other people (work or school is a good place to do that) so it’s worth it to make a special trip. While I keep my eyes peeled for potential recipients of odd items and, like everyone else on earth, spend a lot of time googling, sometimes the answer isn’t that obvious, and I am forced to use logic and do a little investigation. For example, I had a lot of leftover half-used bottles of alcohol from a party, and offered it to a local struggling art gallery for their openings. They snapped it right up! In the same way, I contacted several places that make art mosaics to see if they took broken dishes, and gave away my used Canola oil to someone who had converted his car from to run on vegetable oil. It is my fervent hope that StuffYouDon’tWant.com inspires people to think about where they’re going to get rid of items at the time they acquire them. Not only would this stop people from making needless purchases, it would also help them make better ones. For example, though people think of plastic as recyclable, it really isn’t (read my rant here) so, if there’s a glass and plastic option for a drink container, I always choose glass. When I buy furniture, I buy quality used furniture instead of cheap new stuff. Not only do I often prefer it, but while IKEA furniture is worthless after it’s been taken apart and put back together a handful of times, a dresser from the 1940s made out of mahogany has already stood the test of time. 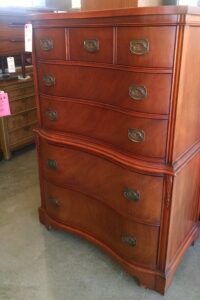 If I treat it well and keep the wood polished, I’ll have no trouble finding a new home for it if I move or redecorate. That’s one less item taking up landfill space. What kinds of things do you try to keep out of the landfill? Nancy Matson maintains an environmental blog, "Stuff You Don’t Want," where she advises people how to keep unwanted goods out of the landfill, item by item. She is a regular contributor to Krrb, a classified ads site, on the topic of used goods, and her writing on other subjects has appeared on WeLikeLA, Narratively, and Bustle. She lives in Los Angeles. What a great idea for a website! I often feel like a hoarder when I don’t get rid of old crayons or clothing hangers–better waiting for use one day in my house than wasting away in a landfill. But this is a great resource to mobilize goods especially for those who are more quick to throw away unused items! What an useful post! I also usually do not like to throw away items just because they are outdated. So, many items in my room are years and years old. I think your tips will help my ‘unwanted’ items to be circulated to individuals who need them more. I checked your website, and I got really interested in the idea of “Library of Things.” But we need community engagement in order to make this happen. I think the words need to be spread out more to the general public. It is also very important to emphasize the environmental and social benefits of donating and recycling unwanted items. Increase in transparency will definitely help the residents to get more involved in these kinds of activities. I love this post – it’s re-inspired me as the seasons are about to change and we will be replacing sandals with boots (my favorite, I must admit). I say re-inspire because my friends and I have done SWAP parties before and I will set one up again. We all sell our clothes at Beacon’s Closet, Buffalo Exchange, etc. but a SWAP party will allow us to gather up what didn’t sell and trade with each other. Did I mention there’d be cocktails too? I think it’s great that you turned your ideas into a useful website. I am also someone who tries to avoid contributing to landfill. 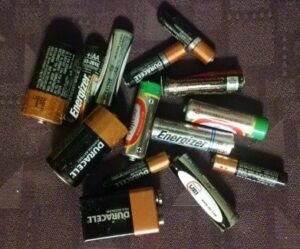 One note is that in NYC, we have been told that we can throw our batteries into the garbage as they no longer contain mercury. However, it’s still probably better to recycle them, if possible, through a special collection. This was a great post and interesting read. From having time spent working in the Recycling and Sustainability field where I worked with facility managers and marketing associates in many of NYC landfills or dumpsites, this post provides awesome incite on alternative options regarding miscellaneous items in your household that could be considered waste. Reuse and regifting are great alternative options to just throwing things away. People can be creative and making a post with a picture of items could not only reduce waste but your also making someones day most likely. So many fascinating tips here! I have always been a big advocate for proper recycling of e-waste and other hazardous materials, however this article takes waste management to a new creative level. Currently I am living in Madrid, Spain a major cosmopolitan city similar to New York City, where modern art galleries flourish on every corner. I will definitely keep in mind the possibility of giving old items to artists or other opportunities throughout the city. I think one of the most important takeaways from these tips is the tradeoff that always exists with waste. It is definitely necessary to understand what the tradeoff is of using greenhouse gas emissions to perform an action intended to reduce waste. 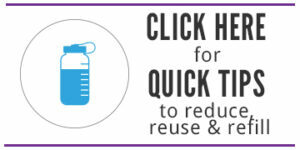 Overall, these are some great tips to add an extra boost of waste-prevention in daily recycling activities. What a great and inspiring article, Nancy! I really appreciate what you said at the end of the article about furniture. As a waste-conscious New Yorker, it drives me CRAZY to see so many perfectly good pieces of furniture out on the sidewalk with the garbage. But NYC is getting more creative with waste reduction in other ways. For example, people are not just donating hyperlocally but “Sharing, Swapping, and Borrowing”, too. The GrowNYC Stop ‘N’ Swaps are greta for this (Jacquie went to one, and it looked pretty fun! http://www.wehatetowaste.com/nyc-swap-events-sustainability/). But we can do even more, like create a sharing closet in your building. I highly doubt everyone in the building wants to vacuum at the same time: why not share one? Also, Housing Works will pick up your clothing (http://www1.nyc.gov/assets/dsny/zerowaste/residents/re-fashionyc.shtml), furniture and home goods ( (http://www.housingworks.org/donate/free-furniture-pickup/). Now all those people who just throw stuff away willy nilly because “it’s too much effort” to donate, don’t have an excuse! We Hate To Waste actually just came out with a really helpful guide of 60 tips to help New Yorkers keep their stuff out of landfill (http://www.wehatetowaste.com/nyc-zero-waste-resources/). And, pretty much wherever you are, you can give your stuff away hyperlocally with freecycle.com or upcycle! Erica: I’ve melted old crayons to make candles.